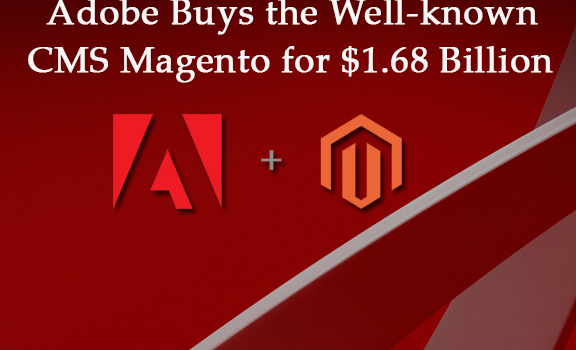 As per an announcement made by Adobe today, it has purchased Magento, well-known Magento development company for $1.68 billion. This acquisition has given adobe an e-commerce platform that was absent in its experience cloud. Magento is a leading e-commerce platform that boasts of a powerful portfolio of cloud-based multi-channel solutions that allows numerous merchants to provide a blend of physical and digital shopping experience to their consumers. Magento will now let Adobe target e-commerce as it is a single platform that offers Magento e-commerce development services to both B2B and B2C clients worldwide. After the closure of the deal, Mark Lavelle, the present CEO of Magento will continue to be the head of Magento team under Adobe Digital Experience. He will report to Brad Rencher, Executive VP, and General Manager, Adobe. Adobe acquiring Magento might turn some tables now. This acquisition will help Adobe to challenge the rival Salesforce that purchased Demandware in 2016 for around $2.8 billion. Demandware is another popular omnichannel e-commerce platform that offers commerce marketplace for retailers and brand manufacturers. It offers similar functionalities as Magento. The e-commerce CMS, Magento connects predictive intelligence, order management, and digital commerce and integrate them as an e-commerce platform that facilitates amazing shopping experiences across a huge range of enterprises. This platform has always been a great choice for companies that have an inclination for creating and managing online stores. Magento e-commerce development services are considered to support total merchandise volume of around $155 billion in its marketplace. It has an array of customers including Helly Hansen, Rosetta Stone, Paul Smith, and Canon. Adobe, on the other hand, is a leader in digital marketing services such as analytics tools and advertising. It is popular for designing and providing digital experiences through data and content. Both Magento and Adobe share common clients such as Cathay Pacific, Nestle, Warner Music Group and Coca-Cola. While open source version is free and available online for web developers to customize and build the application upon, paid version comes with multiple other functionalities and tools such as managed cloud hosting, loyalty program management, and staging tools. This CMS offers a wide community that offers various powerful plugins to amplify its capabilities. Adobe after acquiring Magento, has the power to change the structure of online marketplace. The company is planning to change the way Magento is available in the market whether to businesses or to developers. Adobe says that they will share the details only after the deal is closed in the third quarter this year. The developers are hoping that they let the Magento open source version stays as such. However, there is a piece of relief for the developers and businesses who call themselves Magento development company, that Magento will continue to operate independently until the time deal with Adobe is closed. Adobe, on the other side, has now geared up to win more clients for its cloud services. Adobe has recently made its XD, UI and UX design app free to attract various professionals to their platform.